Smoke and fire is seen from Panama-registered tanker SANCHI carrying Iranian oil after it collided with a Chinese freight ship in the East China Sea, in this still image taken from a January 7, 2018 video. China Central Television via Reuters TV. BEIJING/SEOUL - Rescue crews wrestled to bring a blaze on an Iranian oil tanker off China’s east coast under control on Monday as fire raged for a second day following a collision with a grain ship, while the body of one of the 32 missing crew members was found on aboard. 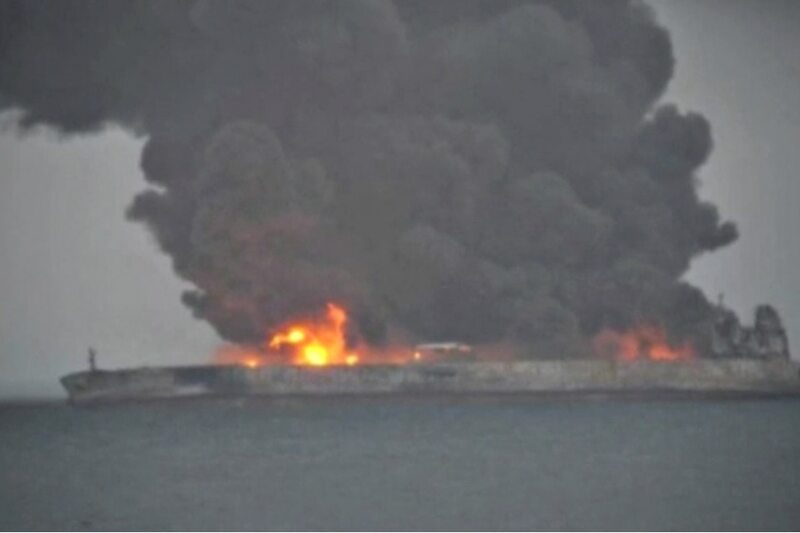 Concerns were growing that the tanker, which hit a freight ship on Saturday night in the East China Sea and burst into flames, may explode and sink, the official China Central Television (CCTV) said on Monday, citing experts on the rescue team. Poor weather continued to hamper the rescue work, Lu Kang, a spokesman at China’s foreign ministry, told a regular news briefing. The size of the oil spill from the ship and the extent of the environmental harm were not known, but the disaster has the potential to be the worst since 1991 when 260,000 tonnes of oil leaked off the Angolan coast. The remains of one of the 32 mariners on board was found on Monday afternoon, Iranian and Chinese officials confirmed. Mohammad Rastad, head of Iran’s Ports and Maritime Organisation, was quoted by the ISNA news agency as saying that the body had been sent to Shanghai for identification. The fate of the remaining 31 sailors is not known. The Sanchi tanker (IMO:9356608) run by Iran’s top oil shipping operator, National Iranian Tanker Co, collided with the CF Crystal (IMO:9497050) on Saturday evening about 160 nautical miles off China’s coast near Shanghai and the mouth of the Yangtze River Delta. Chinese state media CCTV showed footage on Monday of a flotilla of boats dousing the flames with water as plumes of thick dark smoke continued to billow from the tanker. One portion appeared to show the fire had been extinguished, although this could not be independently confirmed. China’s Ministry of Transport and Maritime Safety would not comment when asked if the fire was out. “The Chinese government takes maritime accidents like this very seriously, and has already dispatched many search and rescue teams to the scene to carry out search and rescue,” said the foreign ministry’s Lu said. China sent four rescue ships and three cleaning boats to the site, South Korea dispatched a ship and a helicopter, while a U.S. Navy military aircraft searched an area of about 3,600 square nautical miles (12,350 sq km) for crew members. The Panama-registered tanker was sailing from Iran to South Korea, carrying 136,000 tonnes of condensate, an ultra-light and highly volatile crude. That is equivalent to just under 1 million barrels, worth about $60 million, based on global crude oil prices. Ship tracking data shows the collision occurred in waters not frequently used by large vessels like tankers, dry-bulk carriers or container ships. Most ships travel either closer to the Chinese coast in the west or more nearby to Japan in the east. The freight ship, which was carrying U.S. grain, suffered limited damage and the 21 crew members, all Chinese nationals, were rescued. China’s transport ministry said the CF Crystal were being taken to the port of Luhuashan, just south of Shanghai, where authorities will start an investigation into the cause of the incident. Lu said it was too soon to discuss how victims of the disaster may be compensated, and that compensation and other questions would be addressed after an investigation into the accident is complete. Bad weather made it hard for the rescue crews to get access to the tanker, but toxic gas from the burning oil posed a major risk. When condensate meets water, it evaporates quickly and can cause large-scale explosion as it reacts with air and turns into a flammable gas, the transportation ministry said on Monday. Trying to contain a spill of condensate, which is extremely low in density, highly toxic and much more explosive than normal crude oil, may be difficult. When liquid, most condensate is colorless and virtually odorless. Surface spills of condensate are therefore difficult to detect visually, making them hard to manage and contain. Tankers also carry shipping fuel, known as bunker, which is extremely heavy and toxic when spilled, though much less explosive. The Shanghai Maritime Bureau’s navigation department said the collision did not affect traffic in and out of Shanghai, one of the world’s busiest and biggest ports, or ports along the Yangtze river. A spokesman for South Korea’s Hanwha Total Petrochemical Co Ltd., which was due to receive the cargo, said it would use its own stockpiles to replace the lost cargo.